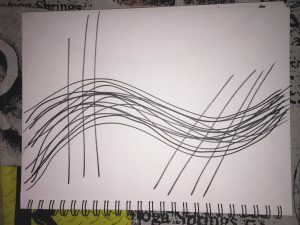 Fast: This image represents an abstract idea of what cars look like speeding down the highway. 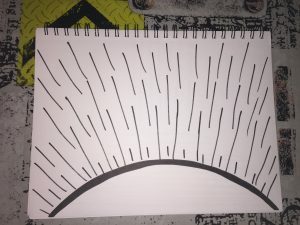 The intersecting lines represent bridges that overpass the highway. Bright: This image is a representation of the sun and how bold and bright it can be. 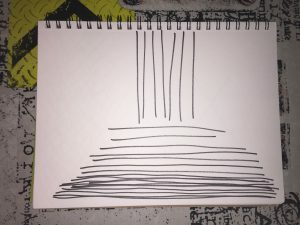 Heavy: This image has darker thicker lines near the bottom of the page to represent the force of weight on the top of the page. 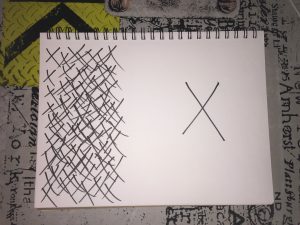 Lost: This image represents how the x on the right side of the page has become lost in the x’s on the left side of the page.